The Library of America has published four of Ross Macdonald's crime novels and Maureen Corrigan offers her view of the late great crime writer at NPR. 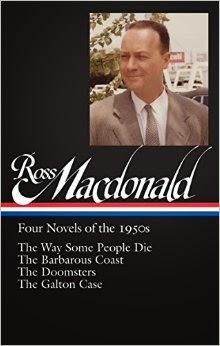 Ross Macdonald had a smart answer to the tedious question of why he devoted his considerable talents to writing "mere" detective stories: Macdonald said that the detective story was "a kind of welder's mask enabling writers to handle dangerously hot material." Like Dashiell Hammett and Raymond Chandler (the great hard-boiled masters whom he revered), Macdonald set out to excavate the dark depths of American life, but to find his own "dangerously hot material" Macdonald descended into uncharted territory. His hard-boiled predecessors had walked the mean streets of San Francisco and Los Angeles; Macdonald moved to the suburbs — a California landscape of mortgaged dreams that already seems exhausted in the four mystery novels of the 1950s reprinted in this Library of America collection. All those images of suburbia-gone-sour that distinguish the work of a John Cheever, Richard Ford, Tom Perrotta, or even the early seasons of Mad Men owe something to Macdonald's penetrating vision.